The BJP repeated its winning performance in the municipal polls in Gujarat, but saw a decline in its seats this time around. The party won in 47 of 75 municipalities this time – a drop from the whopping 59 it had won last time. The Congress, however, improved its tally from the 2013 elections to 16 wins this time. It had won 13 municipalities in the last election. “In today’s 75 municipalities elections results, BJP has won 47, Congress has won 16, NCP 1 and BSP 1, (in) 6 no one got majority and independents got 4,” said the state’s election commissioner Varesh Sinha. 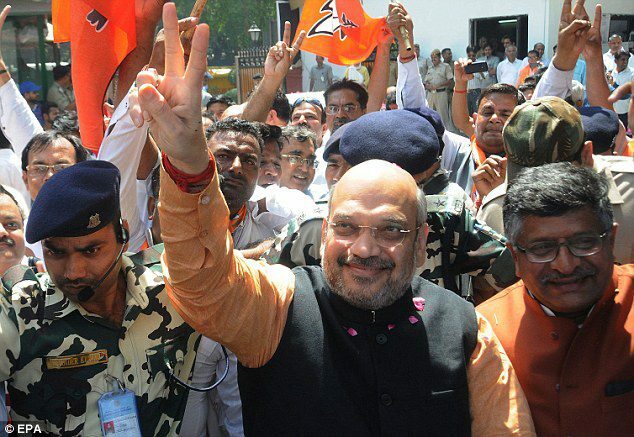 These results follow the trend from the Gujarat Assembly polls, where the BJP registered a victory with 99 seats – but far lower than the 150-plus seats it had hoped for. On the other hand, the Congress bettered its tally by securing 77 seats in the Assembly. The local body polls in the state were held on February 17 for the municipalities, two district panchayats, 17 talukas and 1400 village panchayats. Be the first to comment on "Gujarat municipal polls 2018, BJP wins, but saw decline in seats"